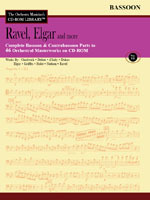 The Complete Violin I and II Parts to 46 Orchestral Masterworks on one CD-ROM. If these parts were purchased separately, this collection would easily cost $500.00 or more. Works are viewable and printable on either PC or Macintosh. No access codes or special software is required. The CD employs Adobe Acrobat Reader technology which is included on the CD. Contents: CHADWICK Symphonic Sketches; DELIUS Brigg Fair, In a Summer Garden, On Hearing the First Cuckoo in Spring, Summer Night on the River; D'INDY Symphony on a French Mountain Air; DUKAS Symphony in C, La Péri, Sorcerer's Apprentice; ELGAR Cockaigne Overture, Enigma Variations, Falstaff, Froissart, In the South, Introduction and Allegro, Pomp and Circumstance Marches 1-4, Serenade for Strings, Cello Concerto, Violin Concerto, Symphonies 1 & 2; GRIFFES Pleasure Dome of Kubla Khan, Poem for Flute, White Peackock; HOLST The Planets; NIELSEN Symphonies 1-5, Violin Concerto, Helios Overture, Maskarade Overture and Dance; RAVEL Alborada del gracioso, Daphnis et Chloé Suites 1 & 2, Mother Goose Suite, Pavane pour une infante défunte, Rhapsodie Espagnole, Le Tombeau de Couperin, La Valse, Valses Nobles et Sentimentales.